Area: Julu Lu, near Fumin Lu -- the last place you wanna be stuck in a cab during rush hour. There's a giant building there that used to be a watch factory, then a warehouse, and later, a popular restaurant called Mesa & Manifesto, which shuttered in 2011. The building stood vacant for years because allegedly the landlord would only lease the entire 6,000-square-meter (!!!) 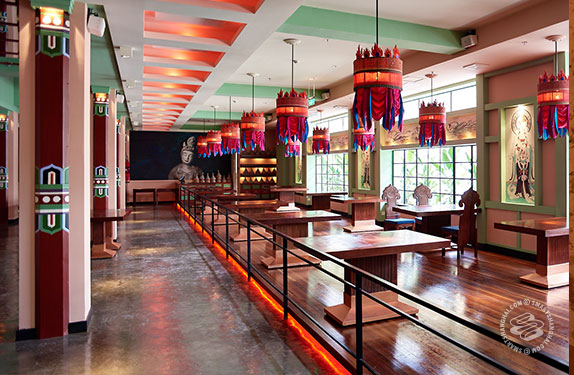 place, which Yunnan fusion chain Lost Heaven took them up on. This classic neighborhood is also home to Kartel, Kung Fu Komedy Club, Egg, Strictly Cookies, Tepito, Tsui Wah, Al's Diner, and at least 100 other cafes, restaurants, bars, and shops on Julu, Changle, Fumin, Xinle, and Donghu Lu. A few blocks north and you're in Jing'an. 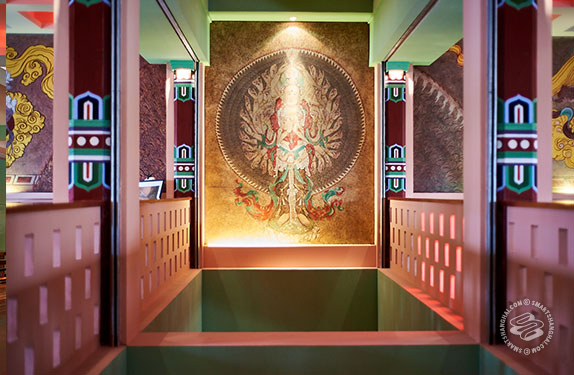 What It Is: A huge, Silk Road themed restaurant and multi-concept building from the ever-expanding Lost Heaven empire, which is headed by the Yin brothers, who grew up in Taiwan after their parents moved there from Yunnan. They also run Coconut Paradise, which will open at Shanghai Disneyland in July. Before we get into Lost Heaven Silk Road, here's what's happening in the whole 6,000-square-meter building, which will have 400 employees and four main venues by the end of summer. 1. 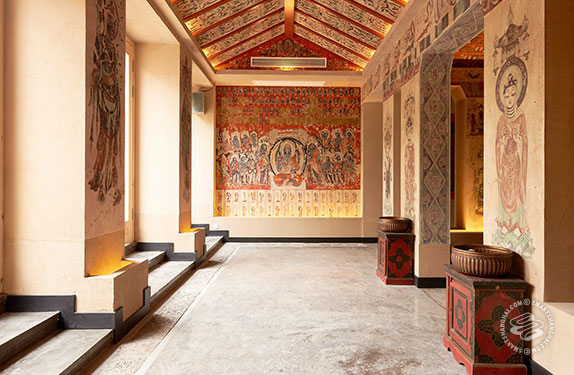 Lost Heaven Silk Road (open now) -- The flagship restaurant, featuring the greatest hits of West China cuisine (grilled meats and breads, oat noodles, all kinds of lamb, eggplant dishes, yogurt) a giant patio, and full-on replica Dunhuang cave paintings. 2. More Than Eat -- This will fill most of the first floor, with a bakery, a butcher, a speciality grocery store, an oyster bar, a wine bar with 44 wines by the glass, a draft beer bar, an ice cream stand, and more. Opens at the end of April. 3. Soul Kitchen -- A French Asian fusion restaurant opening in June. 4. 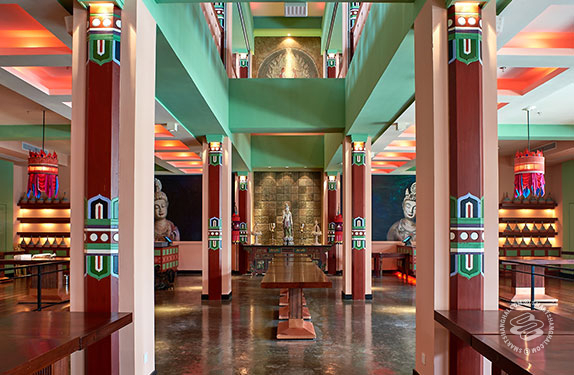 A private, prix fixe Yunnan restaurant on the fourth floor. Anyway, Lost Heaven Silk Road is the main feature here. Spread over two floors, it seats 350 people, including 100 or so on a second floor patio that faces south and overlooks Julu Lu at a height the flower ayis can't reach. The project was born two years ago when the Yin brothers did a road trip out west on the Silk Road and the Tea Horse Road, two crucial trading routes that connected China to the outside world back in the day. With that, you've got decor and food from places like Xi'an, Lanzhou, Dunhuang, and out to India, Kazakhstan, and Afghanistan. Other ideas like the bakery and the ice cream shop came later. It's a big building to fill. Atmosphere: Postmodern Silk Road and Tea Horse Road vibes, and probably enough details for a Chinese art history major to spend half a day giving a tour of the place. 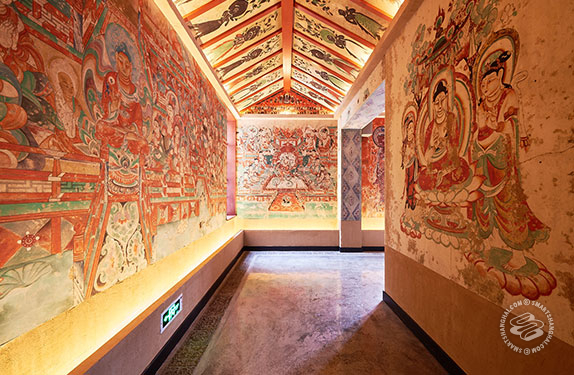 Aside from the antiques and hanging lanterns that ornament the restaurant, Lost Heaven brought in a team of painters from Thailand, West China, and beyond to spend six months filling the walls with Buddhas, fantan pipa players, fei tian, and replica Dunhuang cave art. 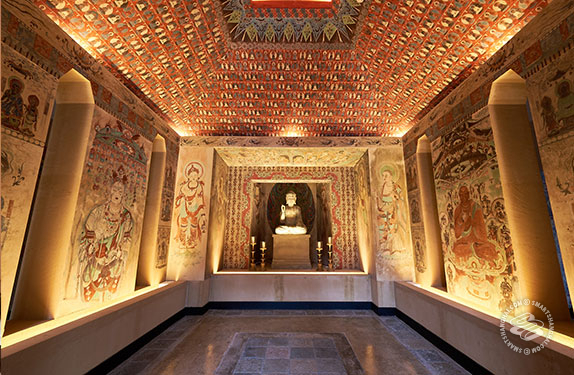 Dunhuang was a crucial intersection on the Silk Road, and over the course of several dynasties and around a thousand years, the thousands of caves there -- especially the Mogao Caves -- were filled with Buddhist paintings, sculptures, documents, and other treasures. Many of the caves were sealed and hidden for centuries then rediscovered. Magical place, lots of stories -- maybe read up on it and visit Gansu sometime. Anyway, on an early visit to Lost Heaven Silk Road, these artists were holed up in a big bright studio upstairs with their acoustic guitars and a small stereo system, just painting six foot tall murals intensely. I sent a close-up photo of their paintings to an artist friend, who asked if I was at that Dunhuang exhibition in Pudong, which is not related to Lost Heaven Silk Road, although that would have been some great marketing. Indeed, these dudes' painting is on point, especially in the lounge that's a built to a 1:1 ratio with Cave 45 but blends in some elements of Cave 390. Here's something not inspired by the Silk Road -- the music is lounge jams and electronica. One of the brothers is a DJ. There will be no nightly performances by ethnic minority bands on Roland keyboards and KTV microphones. Damage: A lot of dishes range from 50–80rmb. Meat heavy selections are in the 100s and up, with the option to feast on a whole Mongolian lamb for 3,500rmb, ordered a day in advance. Two people could sample a decent amount of food for around 300rmb. Beer starts at 30rmb for Harbin and tops out at 50rmb for Hoegaarden; cocktails are around 60–70rmb. The wine list is fairly long, with bottles starting in the 200s. Happy hour is in the works. Who's Going: Probably all kinds of people. This is a big project; almost like a mini-mall with one company running all the shops. Seems casual enough to drink a beer and eat some lamb kebabs on the patio, and fancy enough to bring tourists for a proper dinner. When the whole building is done, it might resemble a Shanghai remix of Dunhuang -- a bustling zone of foods, goods, and Buddhist art. With some low-key house music, naturally.